Vanessa Obioha writes that the Fela-Kuti sons, Femi and Seun have set a record as the first Nigerian blood brothers to get a nod from The Recording Academy Awards, better known as The Grammys. On Sunday, February 10, Seun Kuti will be on the rich lineup of music artistes across the globe like Diana Ross, Miley Cyrus, that will be performing at the 61st edition of The Recording Academy Awards popularly known as The Grammys. He will be performing together with Malian singer/songwriter Fatoumata Diawara at the awards prelude show. Returning to its Staple home Los Angeles after it held in New York last year, this year's edition will celebrate the best music acts and their works in the year under review. Considered music's biggest night, Seun Kuti's performance at the event will be an iconic one that will be celebrated in Nigeria and in the continent. However, Seun is not just attending in a performing artiste capacity. 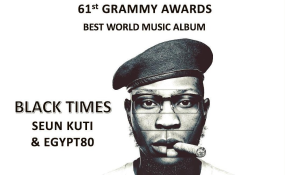 He and the band he inherited from his late father, (Fela's Egypt '80 Band) secured their first nomination in the Grammy in the Best World Music Album category -- a category reserved for international musicians whose works are indigenous and non-Western. Seun's nomination is coming on the heels of his older brother, Femi Kuti who had been nominated four times in the category. Femi's first nomination was in 2003 for his album 'Fight to Win'. The following year saw the Recording Academy splitting the category into two separate awards: Best Traditional World Music Album and Best Contemporary World Music Album. Femi was nominated in the latter in 2010 for his 'Day by Day' album. In 2012, Femi scored another nomination for 'Africa for Africa' when the Grammys merged the two separate awards again. He followed it up with another nod in 2014 for his album 'No Place For My Dream'. With Seun's nomination, it will be the first time two brothers are nominated in that category. Both sons of the Afrobeat legend, Fela Anikulapo-Kuti-Femi and Seun have followed their father's footsteps, taking his unique legacy to the world stage through their music and notably, the annual celebration of the legend's life and music, Felabration. Though Femi is yet to have the gold-plated gramophone trophy, there are expectations that Seun might finally bring the trophy home. Brazilians have dominated the category since its inception with few African artistes like the Beninoise singer, Angelique Kidjo and South African, Ladysmith Black Mambazo emerging winners. The first Nigerian to have shared in the honour in this category was the late veteran drummer and recording artist Babatunde Olatunji. He was part of Mickey Hart's Planet Drum projects, including the album 'Planet Drum', which won the Grammy Award for Best World Music Album of 1991, the first year for which the award was given. Olatunji was also the first Nigerian to be nominated in the category in 1998 for his album 'Love Drum Talk'. Then came Lekan Babalola, the famous percussionist has not one, but two Grammys. His first Grammy came in 2006 for his work on the album 'In the Heart of the Moon' by legendary Malian guitarist, Ali Farka Toure. Babalola got his second Grammy Award in 2009 for being on Cassandra Wilson's album 'Lovely'. Like his father, Seun is known for his uncensored thoughts on politics and other economic affairs plaguing the country. His album 'Black Times' which earned him a spot in the Grammys is laced with political undertones. Released in March 2018, the opening track 'Last Revolutionary' signaled the activist tone the following tracks will exude. In the titular track 'Black Times', Seun who also featured the American-Mexican musician and guitarist Carlos Santana called for a revival of Black History, reminding his listeners why the black heritage must be celebrated and upheld. Other tracks addressed similar notions while bearing humorous innuendoes on the double standards of politicians. For his first nomination, Seun will be contending with Nigerien artiste Bombino (he is the first artiste in his country to fetch a Grammys nod), Diawara, South African, Soweto Gospel Choir who have previously won twice in the Best Traditional World Music category and the Six Degrees Records album: 'Yiddish Glory: The Lost Songs of World War II'. Each of these albums carry their own message of freedom, history and revolution, making the category a tough call for the jury. Perhaps, the odds may swing in favour of Seun which definitely will see the continent celebrating with him. His father, Fela never won the Grammy or was nominated but his music has gone far beyond the walls of his Kalakuta home (now museum) to the global stage. If indeed, Seun should emerge a winner on Sunday, it will assure the rest of the world that Afrobeat is indeed the new sound of music that has taken the world by storm, with an increasing number of devoted bands and solo artistes around the world.